‘Recommend a Friend’ reward scheme. 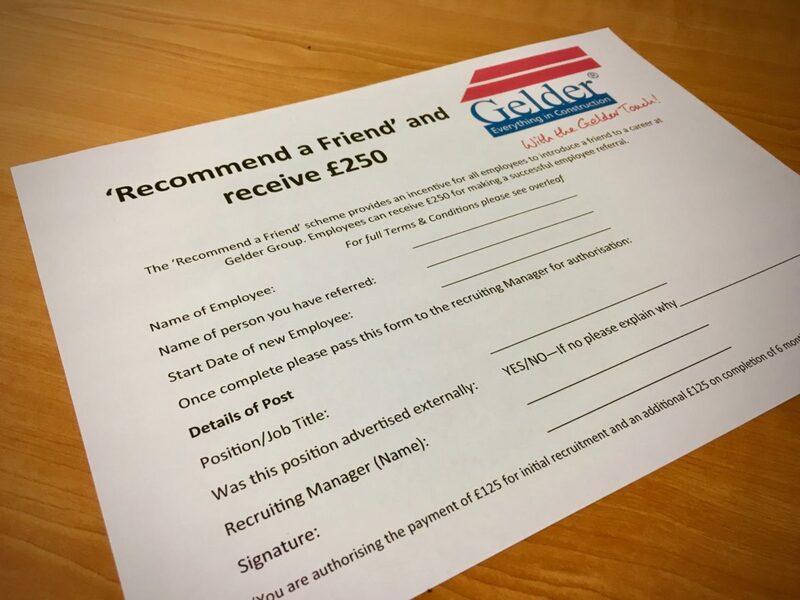 The ‘Recommend a Friend’ scheme provides an incentive for all employees to introduce a friend to a career at Gelder Group. Employees can receive £250 for making a successful employee referral. To be eligible for this referral bonus the employee must introduce someone who is not already known to the Gelder Group for a position that the business is recruiting for. The employee must also be able to demonstrate that they made the introduction, so referrals should be made by emailing their friend’s details, and preferably their CV, to the relevant manager. Any employee who recommends a friend who is then employed by the Group will receive £250; the first £125 payment is made after 3 months service and the second £125 payment is made upon successful completion of the new employee’s six month probationary period. The Employee who makes the referral must still be employed by the Group in order to qualify for the initial payment and the subsequent payment. The employee must be able to demonstrate that they introduced the new employee to the business. Managers cannot claim a referral bonus if they are responsible for making the hire. The payments are subject to Tax and National Insurance. See our career pages for details of current vacant positions.